Sphingolipid de novo biosynthesis is related with metabolic diseases. However, the mechanism is still not quite clear. Sphingolipids are ubiquitous and critical components of biological membranes. Their biosynthesis starts with soluble precursors in the endoplasmic reticulum and culminates in the Golgi complex and plasma membrane. The interaction of sphingomyelin, cholesterol, and glycosphingolipid drives the formation of plasma membrane rafts. 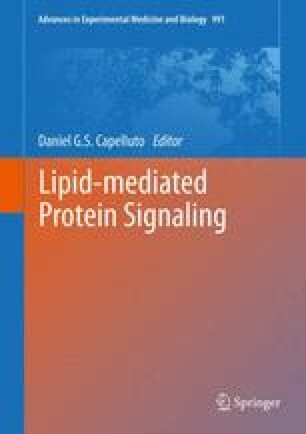 Lipid rafts have been shown to be involved in cell ­signaling, lipid and protein sorting, and membrane trafficking. It is well known that toll-like receptors, class A and B scavenger receptors, and insulin receptor are located in lipid rafts. Sphingomyelin is also a reservoir for other sphingolipids. So, sphingomyelin has important impact in cell ­signaling through its structural role in lipid rafts or its catabolic inter-mediators, such as ceramide and glycoceramide. In this chapter, we will discuss both aspects. This work was supported by NIH grants HL093419, HL69817, VA Merit 000900–01 to XCJ.